Is world politics entering into a new era of post-Western leadership? 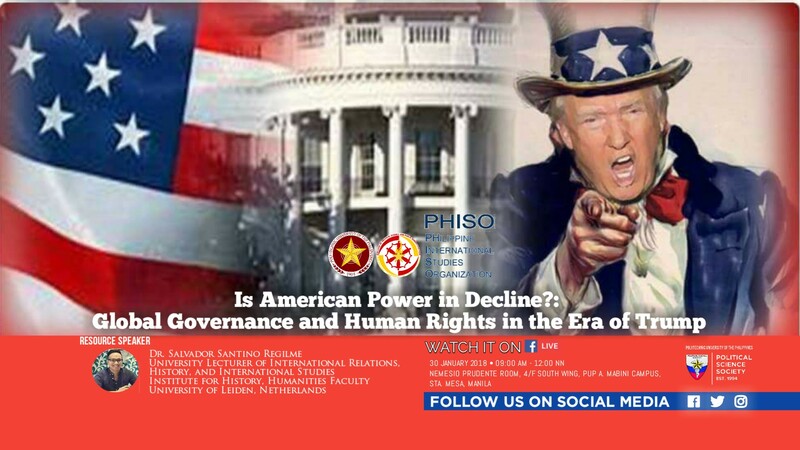 In a purportedly emerging new world order of rising powers, how and under which conditions can the United States and its allies still contribute, or possibly lead, in the resolution of key global governance issues? In this presentation, I offer two key tentative arguments. First, there could be two distinctive scenarios for the future of world order in the next two decades or so: (1) a reduced American influence and power that could be limited to the Atlantic vis-à-vis the Asia-Pacific region becoming more keen to Chinese regional hegemony, and (2) an American leadership that remains robust considering that rising powers’ potential might be greatly undermined by internal political unrest and unstable economic growth. Second, and most importantly, I contend that effective and sustainable American leadership in global governance is most likely to endure when universal human rights and global economic justice remain at the forefront of foreign policies and political rhetoric of the West and its allies. Yet, this does not mean a call for Western moral hegemony. Instead, American insistence on human rights and global justice has to be an open-ended global conversation that emphasizes the right to individual human life as the primary role of states and global governance. In practice, this means the West and American foreign policy ought to empower human rights promoting local actors in the Global South and to cede more key global governance positions to Global South actors, who can potentially provide a more localized understanding of human rights and global justice. In this way, the future of American leadership depends on a stronger commitment to human rights values and empowering actors from the Global South as a way forward for the international human rights regime. Salvador Santino Fulo Regilme Jr. (born 1986) is a scholar of international relations, focusing on global human rights norms, global governance, and foreign aid in the context of international development, and United States foreign policy. He is a University Lecturer of International Studies and History at the Institute for History within the Faculty of Humanities at the University of Leiden, the Netherlands, where he coordinates the Pre-Master European Union Studies Program and serves as a Member of the Board of Examiners of the MA in International Relations Program. He has published (others forthcoming) articles in journals including, among others, Third World Quarterly, International Political Science Review, International Studies Perspectives, Human Rights Review, SAIS Review of International Affairs and the Perspectives on Political Science. He is the co-editor of American Hegemony and the Rise of Emerging Powers: Cooperation or Conflict (Routledge 2018). He is a Member of the Editorial Board of Central European Journal of International and Security Studies, Eastern Europe’s leading English language journal in the field of international relations. Before moving to the Netherlands, he worked as a Käte Hamburger Fellow on Global Cooperation based in the University of Duisburg-Essen, Germany and as a Joseph Carrere Fox International Fellow at the MacMillan Centre for Area and International Studies at Yale University, USA. In 2015, he briefly held a tenure-track position as Assistant Professor within the Department of Political Science at Northern Illinois University, USA. He holds a joint PhD in Political Science and North American Studies (2015) from the Freie Universität Berlin and was educated also at Yale, Osnabrück, and Göttingen. He lives in The Hague, The Netherlands.